Another hoops with 6mm beads attached. 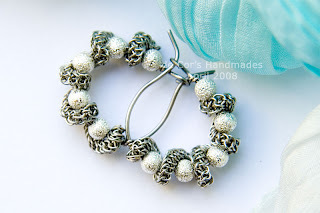 This pair of earrings are greatly inspired by Erin from EarringsByErin. Thanks dear. 20ga stainless steel wires used for the core, perfect for standard pierced earlobes. Silver colors copper wires used for the ZHU.Knotting, 6mm silver color shiny decoration beads have been attached to this pair of earrings. They measures 2cm in diameter, weigh 2.3gram each, suitable for daily wears.